Is Cannabis Bacon A Thing Now? Shut Up And Take My Money! From cannabis infused toothpaste to spiked cocktails, there’s constantly something new coming out that catches our eye. Cannabis enthusiasts are coming up with more and more creative ways to use cannabis. From cannabis infused toothpaste to spiked cocktails, there’s constantly something new coming out that catches our eye. William von Schneidau, who once owned the BB Ranch butcher shop at Pike Place Market in Seattle, claims that feeding his pigs cannabis makes them redder and more savory. Wait, did you just say cannabis bacon? Schneidau’s pot pigs are gaining quite a bit of attention from the media, as well as other farmers and ranchers. This creative way of using cannabis may be considered a publicity stunt to some, but there’s no denying that people are curious to find out more. William von Schneidau has given a whole new meaning to “potbelly pig”. When he says potbelly, he means it. Schneidau filled these pig’s bellies up with cannabis scraps so that he could turn them into some tasty prosciutto for BB Ranch, a butcher shop he once owned in the city’s popular Pike Place Market. The leaves, stems and root bulbs that Schneidau received from Top Shelf Organic, a medical cannabis dispensary, adds no seasoning to the meat, he claims. However, the meat that came from the first couple of “pot pigs” appeared to have been redder and more savory than what he’s worked with in the past. Susannah Gross, a fellow farmer, claims her cannabis-fed pigs were 20 to 30 pounds heavier than the pigs that didn’t eat the special feed. 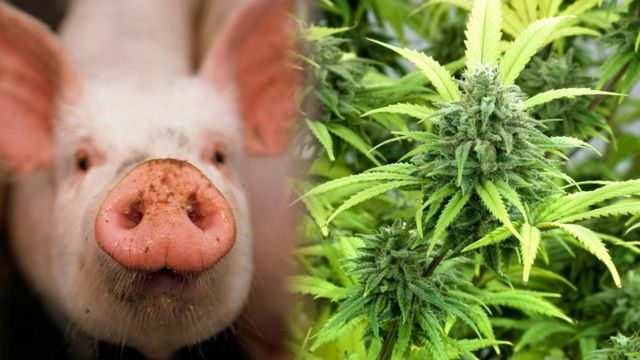 Nobody knows for sure whether or not the pigs are getting high from the cannabis in their feed, or how much, if any, THC is ending up in the meat. The leaves from the strongest of cannabis plants are said to have THC levels as high as 6 percent. Despite this, Schneidau never heard a word from the FDA or USDA, but that’s probably because the whole deal didn’t last long. The butcher eventually went broke and stopped participating in the process. However, Schneidau saw success when he held his first Pot Pig Gig event, where he promoted his products and other local foods. Schneidau’s creative reuse of cannabis could be part of a larger trend of small farmers that are looking for new, and even free, sources of feed for their livestock. The prices for soy and corn have been on the rise lately, so it’s no wonder why farmers are looking for alternatives. The butcher has been able to connect with ranchers and farmers in the area with a vodka distillery and with vegetable vendors at Pike Place Market who have waste that would wind up as compost or be taken to a landfill. 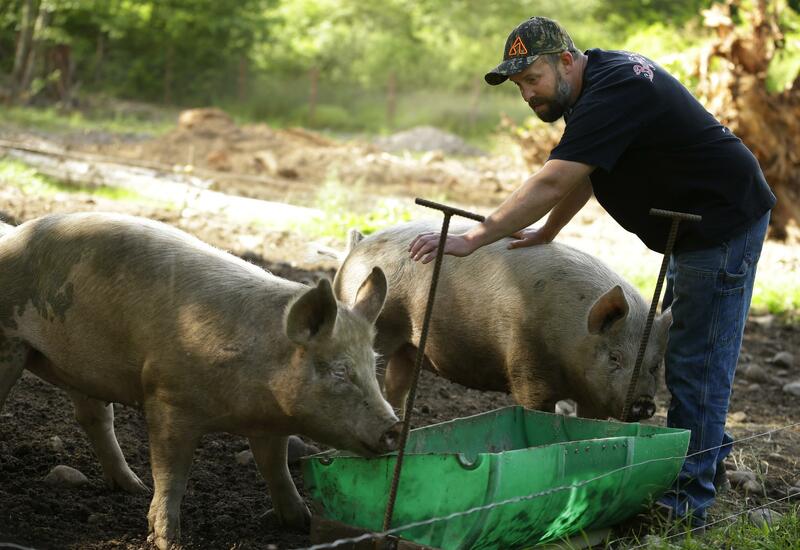 The inclining prices of feed have led farmers to search elsewhere for food scraps and even bakery byproduct, like cereal and pastries, for their pigs and cattle. Pigs have similar stomachs to humans and can eat pretty much the same things we eat. However, no research has been found on what exactly happens when pigs ingest cannabis. Scientists at the European Union Food Safety Authority did their research on the safety of using hemp, a relative of cannabis, in feed for dairy cows. When the cows were fed the hemp, enough THC entered their milk to cause scientists to recommend prohibiting its use. Even adding small amounts of seeds or leaves can cause THC to accumulate in the milk, according to the EFSA. Because of this bizarre find, the EFSA banned Swiss farmers from participating. What’s the future for cannabis feed? Many American farmers remain skeptical about the idea, for now. Being that cannabis has been legalized in many states and the industry continues to flourish, you never know what the future may hold. As for Schneidau, he may not have a clue on what happens when his pigs eat cannabis, but he says he’s all for finding out. If we had a vet that stepped up to the plate and wanted to check out their joints and mood, and what drugs make pigs happy, that would be great. But me, I just get out there, and cut them up, and put them on a BBQ, and eat them. Do you think cannabis is a safe alternative to what livestock is being fed these days? Will reusing cannabis be the next trend among farmers? How much do you want to eat cannabis bacon? Let us know on social media or in the comments below. We would love to hear from you.